Dahntay Laval Jones was born December 27, 1980 in Trenton. He grew up in Hamilton Square and was part of a basketball playing family that included Al Harrington, a cousin, who grew up in Orange. Dahntay was a standout for Steinert High School, a public school known for its baseball, basketball and soccer teams. At 6–6, Dahntay’s path in Spartan sports was clear. He was a four-year starter on the varsity and averaged over 24 points a game as a senior, when he was gained honorable mention as an All-American guard. Dahntay was a good student who was recruited by several schools. He decided to stay close to home, accepting a basketball scholarship from Rutgers over offers from Stanford and Virginia. His parents worked for Johnson & Johnson and he wanted them to be able to attend his home games. Within two years, Dahntay was being called the Scarlet Knights’ best NBA prospect since John Battle in the 1980s. Unfortunately, Rutgers wasn’t looking like a good fit for Dahntay. Although he was the team’s top scorer as a sophomore, the Scarlet Knights were unable to win the close games. At the beginning of the 2000–01 season, people were picking Rutgers to make the NCAA Tournament. Instead, they limped home with a losing record. After the season Dahntay transferred to Duke. He found himself in a tightly run program that did not leave much room for showboating and swagger. Coach Mike Krzyzewski pulled Dahntay aside on many occasions to lecture him about his antics on the court. Behind the back passes, push-ups after dunks, violent screens and arm-flailing rebounds made opponents hate the Blue Devils. To his credit, Dahntay did what was required of him for the Blue Devils to win. He took an opponent’s best wing player and locked him down on defense. Some nights he scored, some nights he didn’t. But with plenty of offense in the Duke lineup, the pressure to go to the hole wasn’t on Dahntay as it was at Rutgers. After two years with the Blue Devils, Dahntay took his next step, into the pros. He was drafted in the first round by the Boston Celtics, who turned around and traded his rights to the Memphis to acquire center Kendrick Perkins. 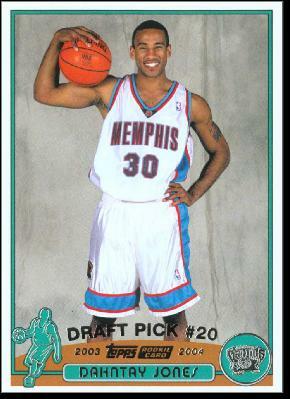 Dahntay played four years with the Grizzlies, mostly as a substitute albeit on a playoff team. Dahntay tested the free agent waters in the summer of 2007 and was surprised to find no takers. He eventually inked a deal for the 2008–09 season with the Denver Nuggets. Dahntay started for the first time in his career, but did not produce big numbers. The Indiana Pacers, always on the lookout for good defenders, signed Dahntay to a four-year deal in 2009 and Dahntay returned to the role of Sixth Man and defensive specialist. He averaged 8.7 points per game in the 2011 playoffs.